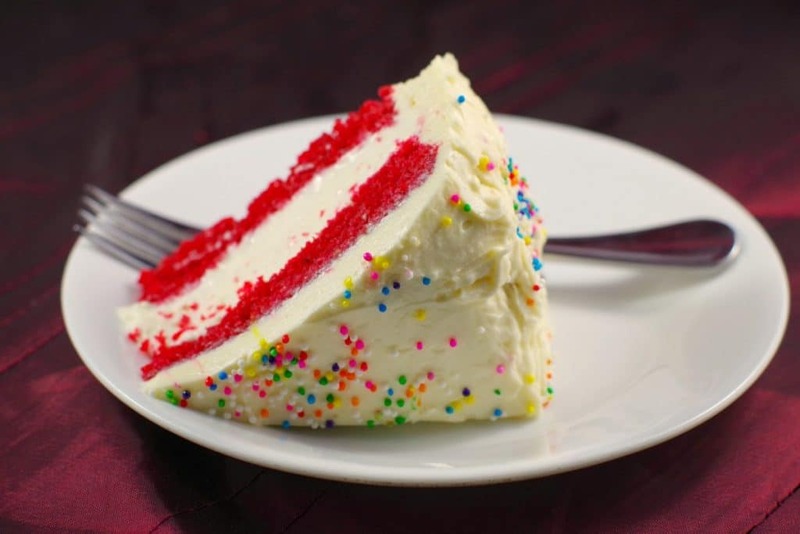 When I asked my son the annual birthday question, “what kind of birthday cake do you want?” and he chose Red Velvet Cake, I was not the least bit surprised. After all, it is his fave. Although, I’m pretty sure red velvet is more popular amongst the ‘bride to be’ set than with 12-year-old boys, not many 12 year-old boys are like mine. Having been exposed to sampling an endless selection of cakes from the time he could eat solid food, this boy knows his cake! We landed on a Red Velvet Ice Cream Cake, just to mix thing up a bit this year. I had never made any kind of ice cream cake before, so my biggest concern was that I didn’t know how I’d make the ice cream for the cake, given I don’t even have an ice cream maker. Turns out, that was to be the least of my concerns. It didn’t even occur to me that I may need a freezer (doh!) And apparently Extreme Air Park does not have a freezer, or even a fridge for that matter. Considering it was potentially going to be a very hot day and my cooler isn’t wide enough for a cake carrier (and cooler’s just don’t cut it when it comes to keeping anything frozen anyway), I was forced to resort to Plan B. Although I must admit, I fought it the entire way, trying to convince myself that my ice cream cake wouldn’t melt in the 3+ hours between the transporting of the cake, the party itself, getting to the party room, eating the food, then finally cake time. I even toyed with the idea of a getting myself new, better, bigger cooler because, let’s face it, I wanted to avoid Plan B at all costs. In my world, Plan B always entails more work. And giving myself more work is something I really do try to avoid. I really did not want to make a second cake! Keep in mind, I was still committed to completing Plan A – the red velvet ice cream birthday cake he actually wanted in the first place (the one you see here)! I’m not sure if you are like me in that Plan B tends to happen all too often? And that would be fine if I was a laid-back, go-with-the-flow type of person. But I am clearly not. I am a planner. And that’s precisely why I plan ahead – to avoid situations like this – scrambling at the 11th hour and stressing myself out. That’s not to say that I can’t handle a few bumps along the way, but a brand new last-minute plan is only a twister waiting to happen for a planner that doesn’t like surprises. In the end, my ice cream problem was easily solved with this delicious no churn cheesecake ice cream filling from Taste & Tell. And I used my favourite Red Velvet Cake (Chef Steph’s Southern Red Velvet) , as well as my favourite Dreamy Creamy White Chocolate Cream Cheese Frosting by Rose Levy Barenbaum, both with a few of my own changes/adaptations, of course. 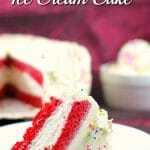 So, if are looking for an easy red velvet ice cream cake recipe and don’t have an ice cream maker, this is THE ONE! 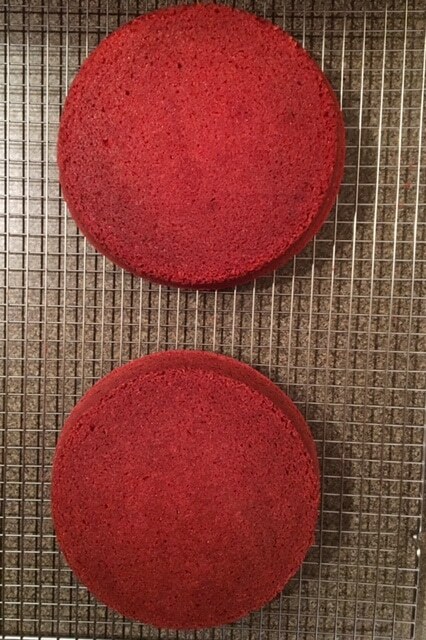 I have made a lot of red velvet cakes and cream cheese frostings over my many years of cake baking and decorating and these are my chosen ones. The no churn ice cream is a cool and refreshing addition to my absolute favorite red velvet cake and cream cheese icing combo! And I did try to keep it easy – no fancy decorating required. I used a cake spatula and a butter knife to swirl it a bit, then put some multi-colored sprinkles on and that was it! The other critical thing I do is I use Wilton Cake Release: Wilton Cake Release, 8-ounce My cakes come out perfect EVERY TIME! The final tip is to ensure they are cold by putting the cakes in the freezer for 10 minutes before icing. Then brush off any loose crumbs with a pastry brush. Happy Baking and Crumb-free frosting! you love red velvet, give these other red velvet recipes a try! 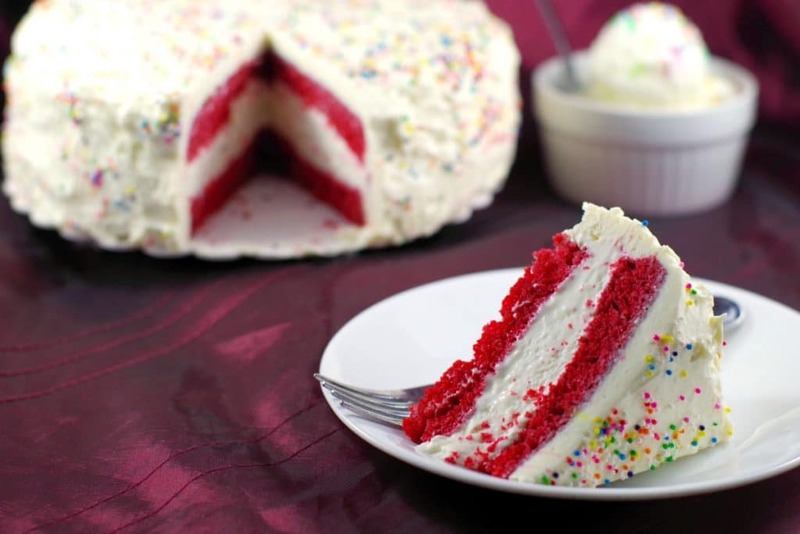 Layers of pillowy, fluffy and light Red velvet cake cushion an easy no churn cream cheese ice cream filling, all smothered in dreamy creamy white chocolate cream cheese icing. Preheat oven to 350 degrees F. Prepare two 8" or 9" round pans. I use Wilton Cake Release to prevent sticking. Add vinegar to milk and let stand for 5 minutes. Sift all dry ingredients together into stand mixer bowl. In another bowl whisk together all wet ingredients. Using paddle attachment and low speed, blend the wet ingredients into the dry ingredients until just combined. Divide between cake pans, filling 1/2 -2/3 full and bake until tester inserted in center comes out clean (about 25- 30 minutes). When cake is done, cool for 10 minutes, then transfer to cooling racks. Cool for another 15 minutes, then level the cake by slicing off the 'hump'. In a large bowl, beat together the cream cheese and the sweetened condensed milk. In a separate bowl, beat the whipping cream until it has stiff peaks. Gently fold the cream into the cream cheese mixture and stir until combined. Line an 8 or 9-inch baking pan with plastic wrap. Add the ice cream to the pan, smoothing out the top. Cover the top with plastic wrap and freeze until solid, at least 6 hours. Melt the white chocolate: Heat the chocolate until almost completely melted. Use a small microwavable bowl, stirring with a silicone spatula every 15 seconds (or use the top of a double boiler set over hot, not simmering, water, stirring often—do not let the bottom of the container touch the water). If you use the microwave, but sure to only heat it on med power (I use level 5 on mine). Remove the white chocolate from the heat and, with the silicone spatula, stir until fully melted. Allow it to cool until it is no longer warm to the touch but is still fluid. Make the Frosting In your mixer: mix the cream cheese, butter and sour cream until smooth and creamy. Scrape down the sides. Add the cooled melted white chocolate and mix until it is smoothly incorporated. Add the almond extract, then add the icing sugar (add a little more or less to your taste). 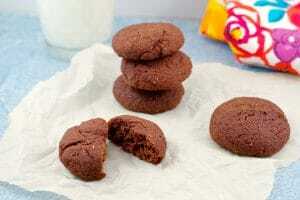 The frosting must be refrigerated and it becomes more firm in the refrigerator. Let it come to room temperature before frosting. Place one cake on a cake stand or cake plate. 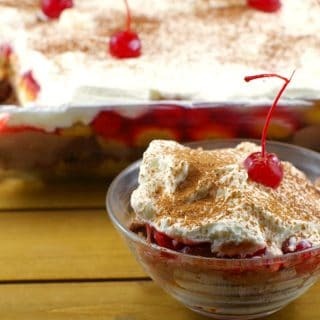 Remove the plastic wrap from the ice cream layer and place one layer on top of the cake. Add another cake. 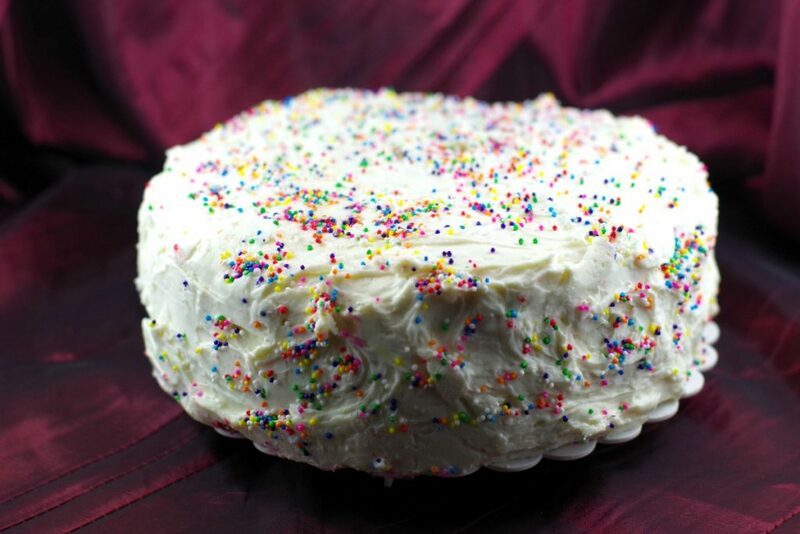 Frost the cake with dreamy creamy white chocolate cream cheese icing. Decorate, with rainbow round sprinkles. Freeze the cake until ready to serve. Thanks so much!It was super yummy and most importantly, my son loves his Plan A birthday cake! Hope you get a chance to try it, Charlotte! I’m so glad I brought it into my life…. Sorry, had to put that here as this combination has been so well immortalized in song. This recipe looks almost as much of a guilty pleasure as the Korean girl group.